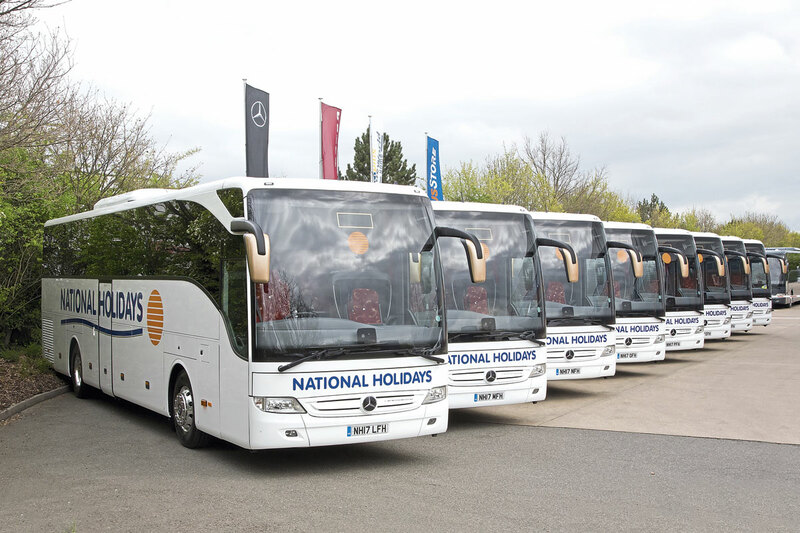 Promptly on Maundy Thursday, the first new Mercedes-Benz Tourismos for the 2017 season were handed over to National Holidays, part of Shearings Leisure Group Ltd. Five of the vehicles were collected from Evobus in Coventry by members of the National Holidays north east team based in Washington ready to undertake their first tours the following day. The five Tourismos are part of the group’s 2017 order for 44 vehicles, 30 three axle Tourismo M 16 RHD for the core Shearings fleet and 14 Tourismo 15 RHD for National Holidays. 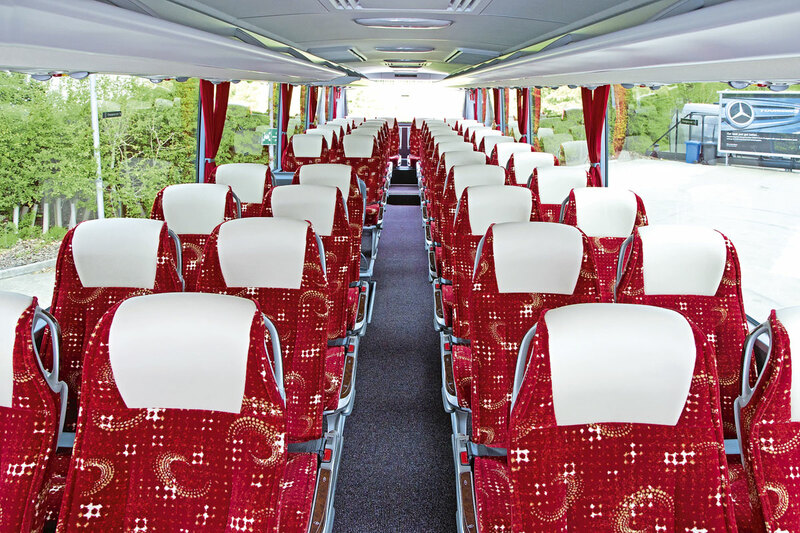 All have 48 seats, the extra length of the Shearings vehicles accommodating a higher seat specification with increased legroom. A key selling point of all the groups vehicles is the back seat which only accommodates four to provide the same level of comfort as all other seats. Shearings’ relationship with Evobus commenced with the landmark acquisition of 45 Setra vehicles in 2009 including 15 two axle S415 GT HDs for National Holidays. 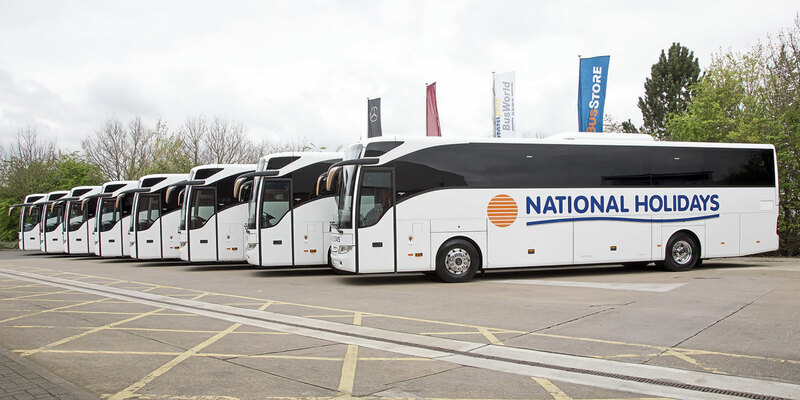 Setra deliveries continued for another five years before a move to the UK specific higher specification Mercedes-Benz Tourismo in 2015 completed the seven year fleet replacement cycle. The 2016 order for Tourismos was the largest then placed for Euro6 vehicles and also began the process of replacing the Evobus sourced fleet, a number of 09 plate Setras readily finding new homes on the secondhand market. 2017 is the third and final year that the current model Tourismo will join the fleet, the recently previewed revised model is expected to be available for 2018. 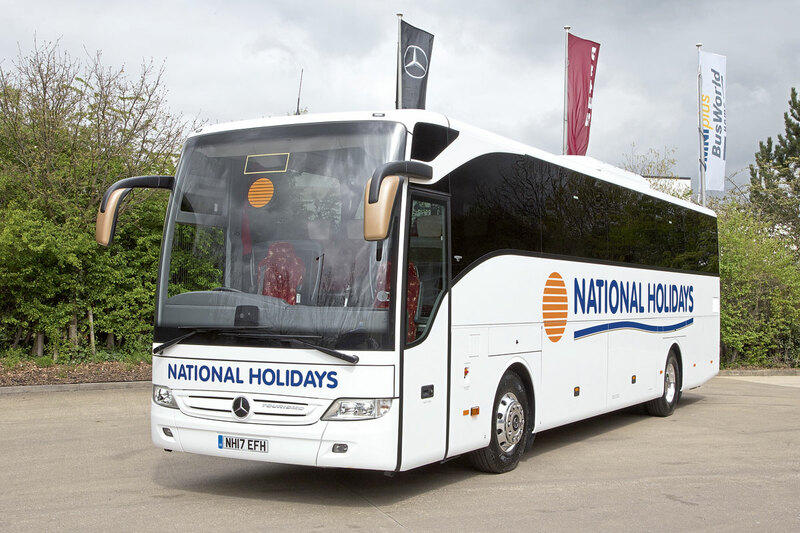 The new vehicles for National Holidays will be distributed across its operating centres in the north east and Yorkshire as part of a programme to ensure that each depot has a number of vehicles less than two years old and under full Mercedes-Benz warranty to service the company’s European tour programme. The National Holidays Tourismos are 12.14m long, 2.55m wide and 3.62m high over the air conditioning system, the wheelbase is 6.08m. 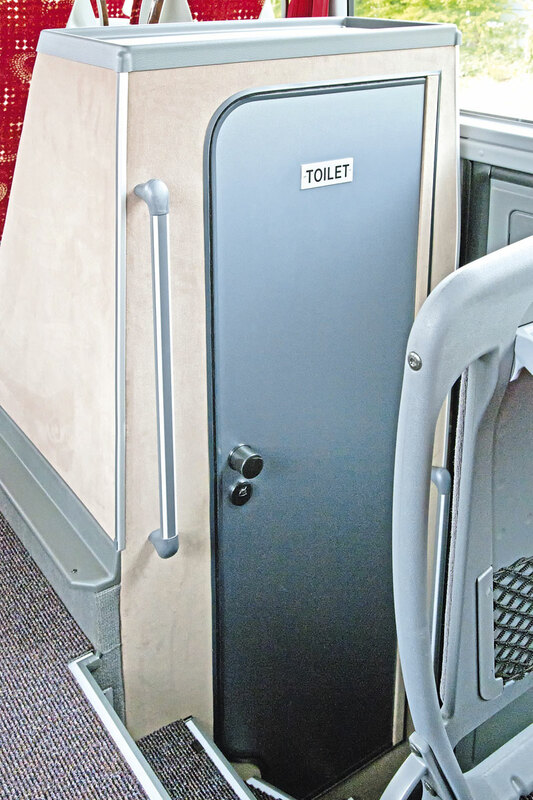 8.4cu m is available for luggage in side accessible lockers and a second entrance is provided amidships on the offside with a toilet adjacent. The side windows are double glazed with one pane being tinted on the 2017 vehicles. Shearings specify the higher 315kW option of the Mercedes-Benz OM470 Euro6 engine for all their Tourismos, coupled to the Mercedes-Benz Powershift GO 250-8, eight speed automated gearbox. A key feature of the vehicles is the range of safety support systems including ESP, BAS, ABS and ASR which have proved popular with the National Holidays driving team. 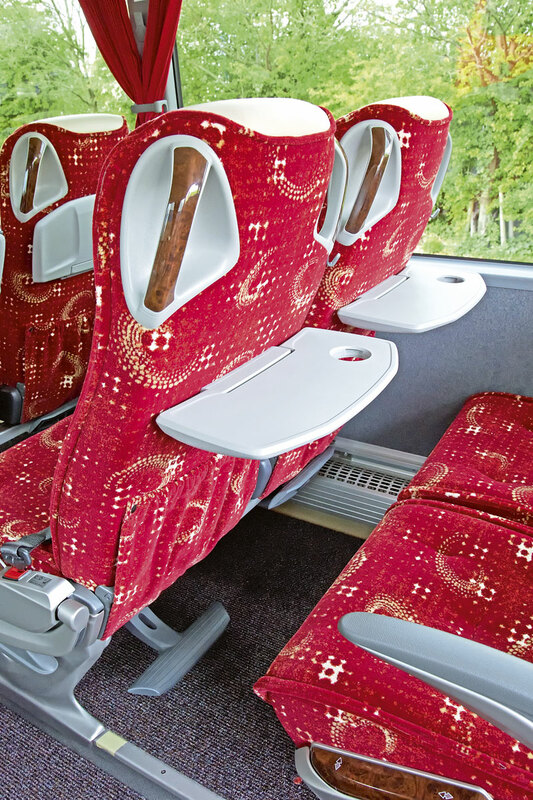 The red fabric trimmed reclining seats with lap belts are specified with armrests on the aisle side, fold down tables, magazine pockets, footrests and integrated wood effect handles at both corners. 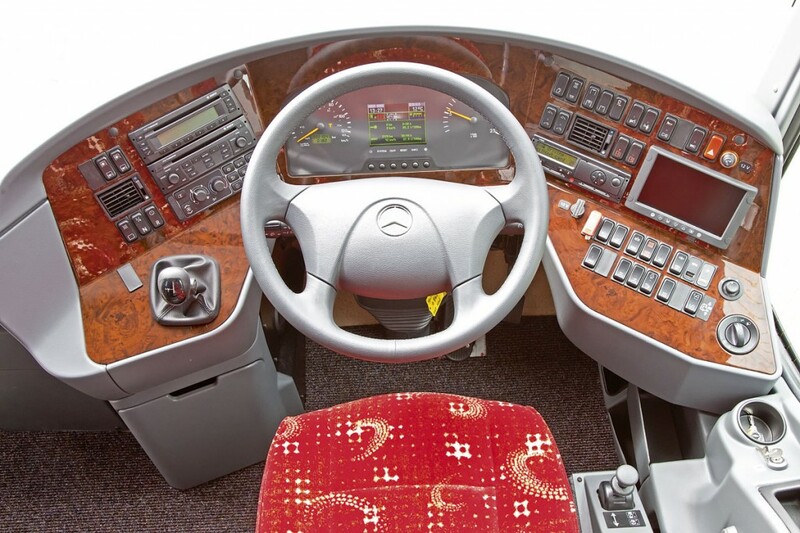 The dashboard also features a wood effect surround with integrated digital tachograph and Bosch professional entertainment system.